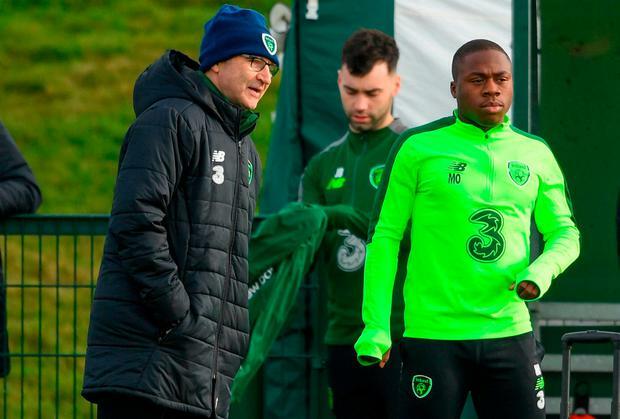 Southampton first team coach Kelvin Davis has urged Republic of Ireland manager Martin O'Neill to hand striker Michael Obafemi a first cap and he believes the chance to play international football in a green shirt would be 'the perfect opportunity' for him. In an exclusive interview with Independent.ie, Saints legend Davis has given an insight into the player who is pondering his international future ahead of what could be a senior debut against Northern Ireland at the Aviva Stadium on Thursday night. While Obafemi has impressed O'Neill and the Ireland coaching staff in recent days, the Ireland boss has confirmed that the teenager is unlikely to play in next Monday's UEFA Nations League game against Denmark as that would mean he commits his international future to Ireland. Obafemi is also qualified to play for England and Nigeria, and the latter have expressed tentative interest in recruiting the 18-year-old who was born in Dublin and moved to London as a child. Yet Davis believes Obafemi would be an ideal player to freshen up the Ireland forward line, as he suggested the youngster could make a huge impact on the international stage. "I have seen Michael coming through the ranks at Southampton and the first thing you notice about him is that he has real pace," Davis told us. "His scoring record for the under-23 side is good and all of us at Southampton were delighted when the news came through that he had been given the call-up by Martin O'Neill. "He is a raw talent in many ways and has a long way to go before we discover how good he can be, but the raw materials are there to be developed and I believe he could have a big impact in that Ireland side. "Clearly, Ireland's big problem since Robbie Keane's retirement is goals and and bit of a fear factor in their forward line and Michael could certainly bring a bit of that with his pace and I believe playing at international level now could be great for his development. "In my opinion, Ireland would be mad not to try and get him in their squad on a full-time basis and if that means giving him at a cap in a friendly game to try and get him on board, they they should do it." With Declan Rice still uncertain over his international future as he ponders a switch to England after playing three senior matches for Ireland, the doubts over Obafemi's future has sparked suggestions that O'Neill should not be calling up players who have yet to decide whether they want to wear a green jersey.